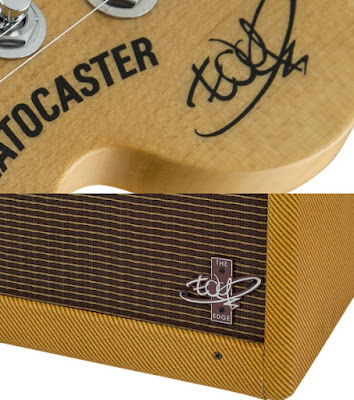 You're looking at close-ups of two of Fender's newest products, just announced this month: an Edge-branded Stratocaster guitar and amp. Officially, they're called The Edge Strat and The Edge Deluxe, and Fender will have them ready for sale later this year. The guitar carries a list price of $1800 and the amp runs $2400, so these aren't for casual wannabes like me. The Strat's web page says it was "co-designed with The Edge," while the amp's web page says it was "tweaked to the discerning tastes of U2's renowned guitarist." If you're a guitar aficionado, those pages also have lots of technical specifications -- especially the guitar. Edge and Bono both joined the Fender Board of Directors in 2014. At that time, Edge said he was "most interested in working with the Fender design team on some new ideas." 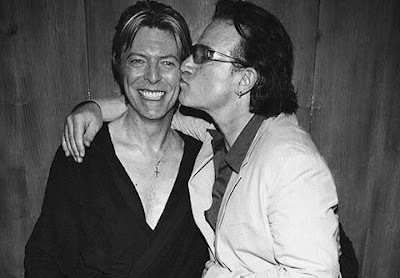 U2 responds to the sad news of the death of David Bowie. Willie Williams, U2's Show Director, remembered working with Bowie for three years. 'It was the personal things that were most impressive. He seemed to be acutely aware that some people (particularly Brits about my age) might likely become catatonic in his presence and genuinely went out of his way to put them at ease.